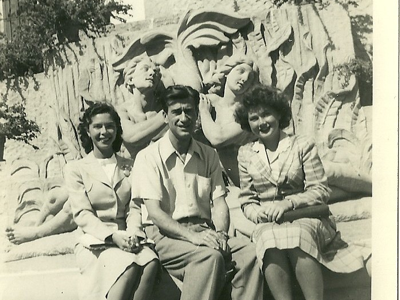 Me, my sister Liz and my brother-in-law Phil (1943). Fifty years ago, my brother-in-law, Philip C. Lewis (pictured above), wrote and published a “playlet” called the “The American Dame”. It’s not a play with a plot, but a play with a singular theme that is read by different characters. His playlet traced an arc of how women have struggled for independence and recognition, respect and equal treatment over the course of history. He even goes back to the Bible, referencing that within the story of Adam and Eve, Eve is set up because she is cast as the sinner; the temptress that causes Adam to fall from grace. He moves forward to the fight women waged to get the right to vote, and how the Equal Rights Amendment, first introduced in 1923, remained un-enacted in 1964 (and I might add is still un-enacted in 2014). For some reason, my brother-in-law’s musings on the short shrift accorded women struck home when I read an article in The New York Times about how Dov Charney, the founder of American Apparel, was finally dismissed for treating his women employees like chattel. This 45-year-old man conducted an interview of a prospective employee wearing a towel. Would he have donned such attire if the prospective interviewee was a man? I highly doubt it. Would any woman CEO anywhere don a towel for an interview, male or female? No way! Later, the DovMan forced his employee to perform various sexual acts, and there is no way anyone can say such behavior was consensual when the pressure to do as you are told is coming from the boss. That the DovMan is fighting to get his job back is laughable. Talk about a disconnect from reality. It is fascinating to me, an octogenarian on my way to being a nonagenarian, that there are still corporate moguls running multi-million dollar companies who believe they have carte-blanche entitlement to treat women different than men, basically because they are not men. I am well aware that great gains have been made. Sheryl Sandberg of Facebook and Marissa Mayer of Yahoo are not oddities. Women have been and continue to break into the upper echelons in every field. But the fact remains that the issue of women being seen for who they are, and not as objects for amusement has hardly been swept away. There remains a strain in society that still blames a woman when a man misbehaves. And that is not to dismiss the reality that there are also legions and legions of men who find the DovMen of the world abominable. The Board at American Apparel did get around to ousting him The question of why it took so long is part of the issue and a different blog. It’s a long cold winter. I have found when the weather is not cooperating because ice slicks the street, or the high temperature for the day is 11 degrees, my 85-year-old body controls my 50-year-old head, and tells me I best be homebound with a book. This is not a problem, as I have been a life-long reader, but I am looking forward to spring, when I can walk about and see theater without worrying whether the weather will permit me to get out the door. So, for now, I’ll muse on last season. I am a member of the Signature Theatre– it’s an off-Broadway venue located west of the Port Authority on 42nd Street. Way back in 2012, I was thrilled with their production of Edward Albee’s play “The Lady From Dubuque.” In fact so thrilled, I saw it twice. That the great Jane Alexander, a mere septugenarian, was starring in it, not as the Lady from Dubuque, but the woman that the lady from Dubuque visits, just made it all the better. And really, you cannot imagine how a great playwright can convert death into entertainment. My 2013 subscription kicked off with “Old Friends,” by Horton Foote, and as we all know, there is nothing like “old friends.” It was a really wonderful play – real family, real problems and super performances. Not to be overlooked was the small, but heartwarming and heartbreaking, Samuel Beckett play “All That Fall,” with a couple of more great actors in their 70s – the beautiful Eileen Atkins, and the magnetic Michael Gambon. It is quintessential Beckett in that nothing happens, except he has managed to capture all that is poured into the daily ritual and banality of life into a one act play. Meanwhile on a pragmatic note, I have learned that the best way to get a seat is to head over to the theater. I can pick my seat, and avoid those awful ticket charges. So when I read the accolade-ridden review at 10:00 a.m., I immediately headed over to the box office. And glad I did, because I got the very last ticket! It had sold out! Rounding out my choices was “Murders For Two.”. I was not too keen on seeing it. But while seeing “Richard III,” I mentioned to my friend that my nephew planned to see it, and lo and behold, the woman sitting in front of us turned around and said I am a friend of the playwright. Well, I had to buy a ticket, and reluctantly went. Quel surprise! It was delightful in every way. A totally different moment than all the other plays I had seen. An ingenious musical that plays like old-time vaudeville. Hilariously funny, and brilliantly conceived. Okay that’s the good stuff. The bad stuff was “Betrayal.” I was betrayed by this insipid, awful presentation of Harold Pinter, one of my very favorite playwrights. Let me just conclude here. I believe I, who is further right of 50 than the rest of you Write Side of 50 contributors, has earned the right to say that getting old has its challenges. That being said, there are some perks I would not give up – such as being able to indulge all my passions for live performance in all its forms, be it at early-morning rehearsals, middle-of-the-day concerts, and every once in a while, an evening gala. 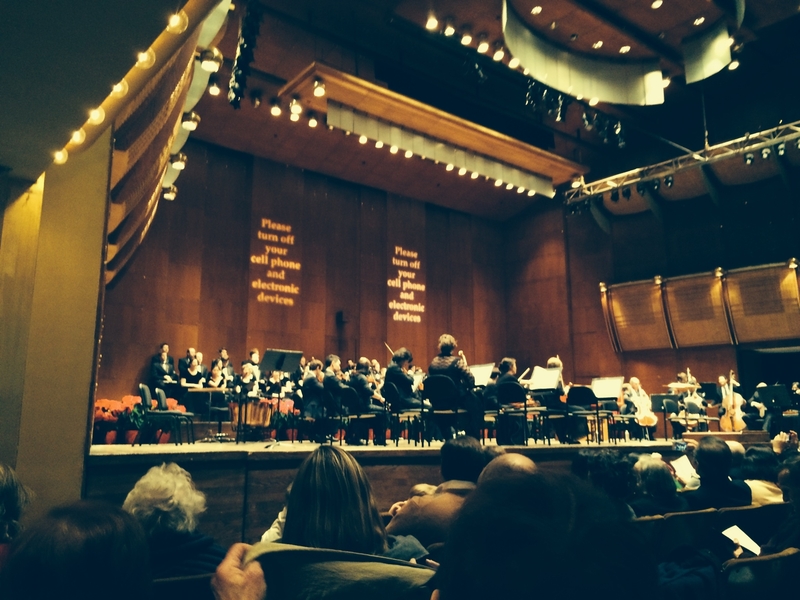 The Philharmonic’s final concert of the fall season was its magnificent performance of Handel’s “Messiah.” Along with the full orchestra, the Westminster Choir belted out music that soared through the Avery Fisher auditorium. Then there was the gala opening concert with the cellist, Yo-Yo Ma, who played Osvaldo’ Golijov’s, “Azul”, which had been written just for him. That, combined with a series of tangos by Astor Pantaleón Piazzolla, made it a double-header afternoon. I had never heard of Piazzolla before (he was an Argentinian tango composer), and this was my first time having the privilege to hear Yo-Yo Ma. I do not know if any of you have ever watched him play. It is not merely his technical virtuosity of working his bow, and the cello’s strings, but his face and body. Nothing is sacrificed to make music. One piece of music that will be on my list of favorites for ever and ever is Beethoven’s Ninth Symphony. Not just because it is one of the greatest symphonies ever written, but because it will always connect me to my late husband, who cherished this work above all others. So this season, when I saw that Alan Gilbert was conducting his first performance of Beethoven’s Ninth Symphony, I absolutely had to get a ticket. Again, none of my many recordings of the Ninth compare to experiencing the genius of this symphony played by the New York Philharmonic, and sung by the symphonic chorus of the Manhattan School of Music, including the outstanding soloists. And in between I caught a little popular music- Thus sprach Zarathustra, by Richard Strauss (better known to us peasants as the music for the movie,”A Space Odyssey”), and a little romance via Strauss’s, “Don Juan”, which featured the retiring concert master and violinist, Glenn Dicterow. The music was beautiful, and beautifully interpreted. I can hardly await the winter and spring season! A terrific line-up of New York theater. I am a theater devotee – have been since 1944, when I saw my first play: “Oklahoma.” And all I can say is the theater season this fall in New York has packed a wallop. The array of plays that are out there, and that I chose to see have brought me sheer pleasure – just like the “old” days. 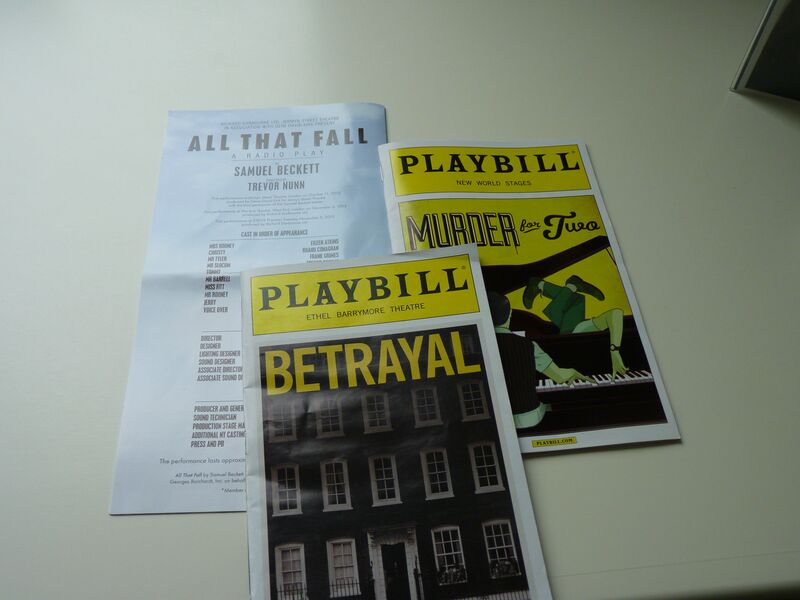 I have run the gamut from off-off Broadway to Broadway, and every time I leave the theater, I am so invigorated, and so thankful that I was able to see these wonderful productions. They took me back to the magic of the theater in the ’50s, when Broadway was teeming with exciting dramas and musicals. 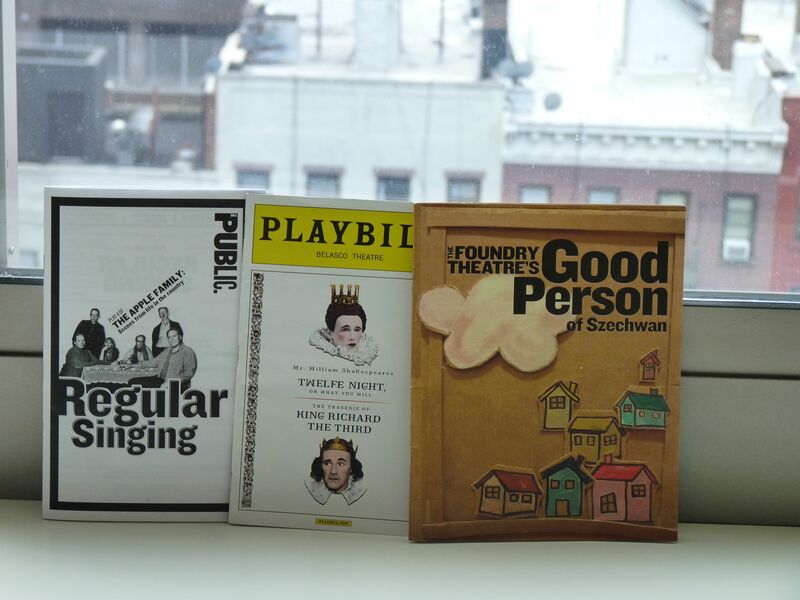 For me, this fall was immeasurably more exciting, because theater has never been better. Last year Mark Rylance’s performance in “Jerusalem,” was so brilliant that there was never a doubt that I was going to see him and his marvelous company in “Richard III,” and “Twelfth Night.” I knew they would be excellent. But they are not just excellent – the performances are a once-in-a-lifetime experience about great theater. I was transported back to 1600, because from costume to set design to language, the show was taking place as if Shakespeare was alive and directing the performance. I was mesmerized by the actors, and their ability to let me experience the genius of Shakespeare. Then there is the magic of the Public Theater, where I saw their magnificent production of The Foundry’s “Good Person of Szechwan,” Bertolt Brecht’s play starring Taylor Mac, and the amazing actors of the Foundry Theater. I sat on the edge of my seat to catch every word because this is one of Brecht’s plays that I was not familiar with, and it was the first time I had seen Taylor Mac. Next up was Public Theater’s presentation of “Regular Singing.” It is the last in a series of the Apple Family plays, written by Richard Nelson. I connected with this play because I felt as if I was back in my home in West Allenhurst, New Jersey, talking with my husband about what was happening in the world. But there’s a bonus: The series is being filmed for a presentation on PBS. And guess who was invited to attend? ME! I will be part of the audience next week when the film rolls. I’ll let you know how it goes.